I remember the first time I saw Eddie Van Halen on MTV, the way he played two hands on the fingerboard during his short “Jump” guitar solo. I loved his cool “Frankenstein” guitar, so named because he cobbled together a variety of guitar parts and decorated his creation with colored tape and paint. Even as a 13-year-old who grew up primarily listening to, and playing, classical music, I felt compelled to run out and buy his band’s “1984” LP at my local Tower Records store. Rock ’n’ roll is an industry that’s continually pushing musical, social, and cultural boundaries, and the electric guitar is its iconic instrument. The acoustic version has been around since at least the 16th century. So when I first started working with co-curator Gary Sturm on an exhibition about the invention of the electric guitar at the Smithsonian’s National Museum of American History, our driving question was: Why electrify this centuries-old instrument? The simplest answer: Guitarists wanted more volume. Through the 19th century, guitars were part of a musical ensemble. As performance spaces increased in size, stringed instruments like guitars were hard to hear over other instruments, especially horns. As a result, the traditional Spanish-style acoustic guitar—wooden with a flat top, a symmetrical hollow body, a sound hole in the center, and gut strings—began to change in size, shape, and construction. 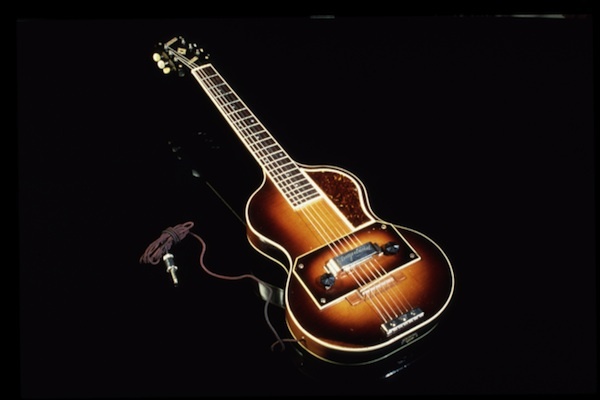 For example, in the late 1890s, Orville Gibson, founder of the Gibson Mandolin-Guitar Manufacturing Company, designed a guitar with an arched (or curved) top that was stronger and louder than the earlier flat-top design. During the first three decades of the 20th century, with the rising popularity of Hawaiian and big band music in America, guitar makers built larger-bodied instruments, using steel instead of gut strings, and metal instead of wood for the guitar body. Around 1925, John Dopyera designed a guitar with metal resonating cones built into the top that amplified the instrument’s sound. That suited twangy Hawaiian and blues music but not other genres. Then, in the 1920s, innovations in microphones and speakers, radio broadcasting, and the infant recording industry made electronic amplification for guitars possible. The volume was suddenly able to go up: way up. Rickenbacker Electro Hawaiian, or “Frying Pan,” guitar prototype, around 1931. The electric guitar was essentially born in 1929—long before the advent of rock and roll music. The first commercially advertised electric guitar was offered that year by the Stromberg-Voisinet company of Chicago, though it was not a smash hit. The first commercially successful electric, Rickenbacker’s “Frying Pan” guitar, didn’t kick off rock ’n’ roll yet either, but it did inspire competitors to jump into the electric guitar market. Invented in 1931, the Frying Pan had an electromagnetic pickup made out of a pair of horseshoe magnets placed end-to-end to create an oval around the guitar’s strings, with a coil placed underneath the strings. The pickup, a device that converts the strings’ vibrations into electrical signals that can be amplified, was bulky and unattractive, but it worked. The commercial version of the Frying Pan was a hollow cast-aluminum lap-steel guitar, and wasn’t an immediate hit beyond some Hawaiian, country, and blues musicians. It differs from the traditional Spanish-style guitar in that it is played horizontally, on a stand or in the player’s lap, and has a sliding steel bar that can be moved along the frets for a gliding effect. There was a lot of tinkering with the Spanish-style electric guitar in the 1930s and 1940s since the electronics in a hollow-body instrument caused distortion, overtone, and feedback—especially problematic for recording sessions. Historians and guitar enthusiasts enjoy debating over who really developed the first solid-body Spanish-style guitar to resolve these sound issues. The National Museum of American History owns a rare Slingerland Songster made in or before 1939. This model is possibly the earliest commercially marketed solid-body Spanish-style electric guitar. A rivalry sprang up between Fender and Gibson, creating some of the solid-body electrics most coveted by musicians and collectors, including the 1952 Gibson “Les Paul” model with a curved top and a combination bridge-tailpiece (the guitar was designed primarily by McCarty, with input by the famous guitarist who endorsed it), the 1954 Fender Stratocaster, and a 1958 version of the Gibson Les Paul with a new “humbucking” pickup that transmitted less background interference from electrical equipment. Fender Stratocaster, Serial Number 0100, 1954. The Fender Stratocaster may be the most widely recognizable electric guitar and the one most associated with the rise of rock and roll music. It featured a distinctive double-cutaway design that allowed musicians to play higher notes by reaching higher on the fingerboard, three pickups (which allowed for a greater range of sounds since previous guitars which had two pickups at most), and a patented tremolo system that allowed players to raise or lower the pitch of the strings. In the hands of guitarists like Buddy Holly, Eric Clapton, Bonnie Raitt, and many others, the Stratocaster became an icon of American rock and roll that took the world by storm. The Stratocaster, the Gibson Les Paul, and other solid-body electrics were nothing if not versatile, and rock guitarists were obsessed with versatility. Guitarists could not only change the tone, volume, and pitch, but they also could manipulate the sound by playing close to the amplifier, grinding the strings against things, and using special effects accessories like the wah-wah pedal. Jimi Hendrix was this instrument’s master of manipulation, influencing generations of guitarists to experiment creatively with their playing techniques and equipment. In the 1970s and ’80s the sound of the electric guitar was stretched in heavy metal music. 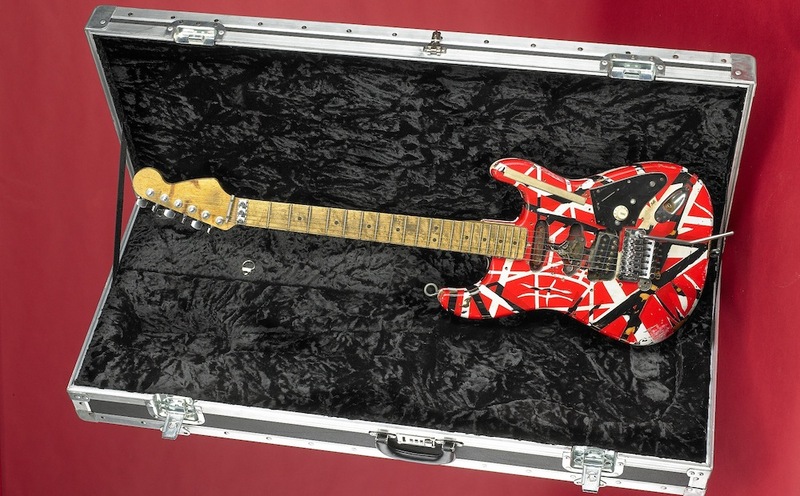 As one of its leading practitioners, Van Halen pushed his self-built “Frankenstein” (based on a Stratocaster but with a mish-mash of other guitar parts) to the limit, experimenting, for instance, with “dive-bombing,” which uses the tremolo arm to drive the guitar’s lowest note ever lower. Hendrix had done this but forced the guitar out of tune as a result. However, by the mid-1980s, inventor Floyd Rose had improved the tremolo system, allowing players like Van Halen to dive-bomb repeatedly. The guitar sound was now not only loud but also really raucous, flashy, and a bit dirty—just the way musicians, and their fans, wanted it. It’s ironic that Leo Fender, the creator of the most influential instrument in rock music, wasn’t actually a fan of rock ’n’ roll; he preferred country and western. But it goes to show you that once something new is out there, you can’t stop makers and players from reinventing it, adapting it for new purposes, taking it apart and putting it back together in new ways. The electric guitar is a prime example of unintended consequences. Initially, it just wanted to be a bit louder, but it ended up taking over and reinventing popular music and culture. Will we even recognize the sound of the electric guitar 10 or 20 years from now? I, for one, hope not. Monica M. Smith is a historian and the exhibition program manager at the Smithsonian’s Lemelson Center for the Study of Invention and Innovation at the Smithsonian’s National Museum of American History. 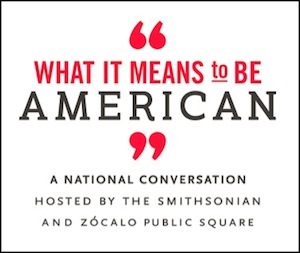 She wrote this for for What It Means to Be American, a national conversation hosted by the Smithsonian and Zócalo Public Square. *Photos of Frankenstein and Slingerland Songster courtesy of the Smithsonian’s National Museum of American History, Division of Culture and the Arts. Photo of Rickenbacker Frying Pan courtesy of John Hall and Rickenbacker International Corporation. Photo of Fender Stratocaster courtesy of Richard R. Smith.